This group of shorebirds on Brigantine Island, New Jersey includes a Black-belled Plover, Pluvialis squatarola; a Short-billed Dowitcher, Limodromus griseus; a Ruddy Turnstone, Arenaria interpres; and two Semipalmated Plovers, Charadrius semipalmatus; offering a good comparison of relative sizes. 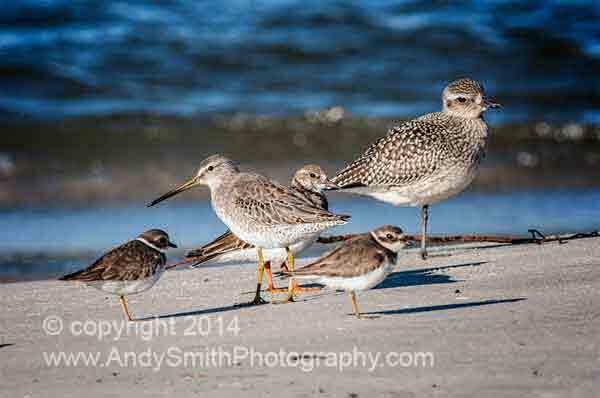 A small group of five shorebirds with four varieties is a rarity. Numerous types occur in larger groups but seldom does such a variety occur in a small group.